Welsh Rugby Union chief Roger Lewis has defended the number of World Cup warm-up games played by Wales following injuries to key players. 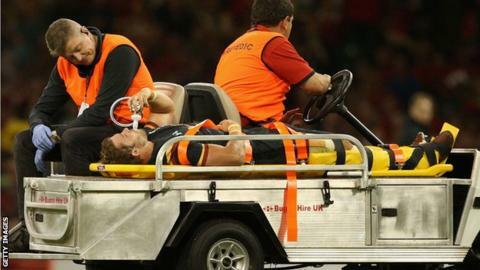 Scrum-half Rhys Webb and full-back Leigh Halfpenny are out after being injured during Wales' third and final warm-up match against Italy. Lewis said: "That's the cruelty of sport and the uncertainty around it. "If I could trade these results for those two players, I certainly would but that is not possible." Toulon full-back Halfpenny, 26, ruptured his anterior cruciate ligament, in his knee, in the 23-19 win over Italy while Ospreys' 26-year-old scrum-half Webb is out because of a foot injury suffered in the same game. Webb has been replaced by Mike Phillips while Ospreys wing Eli Walker has been drafted back in to the squad to take Halfpenny's spot. Warren Gatland's side faced Ireland home and away in warm-up matches before hosting Italy in their final friendly ahead of their World Cup opener against Uruguay on 20 September. Lewis, who will leave the WRU after the World Cup, said the warm-up matches were essential for the squad's preparations ahead of the tournament. "As Warren rightly said the guys have got to play these games and that's been the same for every single nation throughout the world," Lewis told BBC Radio Wales. "That game in Ireland which Wales won was a far more physically contested game than last weekend."